Linda Parker UK Independent Stampin' Up! Demonstrator from Hampshire @ Papercraft With Crafty : Tiny No Glue Cubed Box - Fresh Florals & Ferrero Rocher - What a Combination !!! 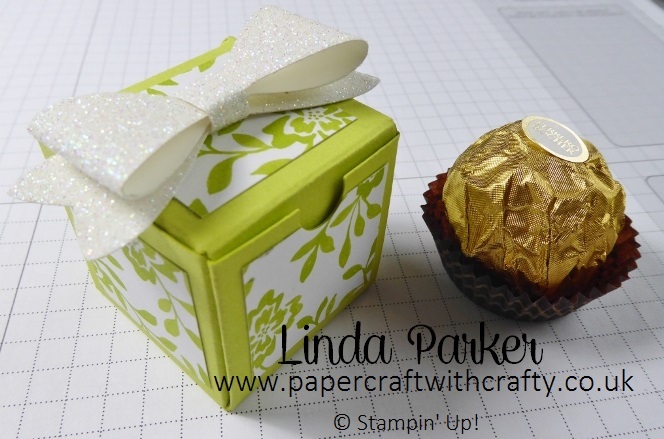 Tiny No Glue Cubed Box - Fresh Florals & Ferrero Rocher - What a Combination !!! It's a little no glue cubed box. I came across the original idea by Elaine Jackson aka Papercraft Button (she is my favourite You Tuber !!) I am a huge fan. Anyway her video tutorial demonstrated a much larger version of this little one, but I took her template and created this tiny 1 1/2" inch cubed teeny weeny diddy mini version. Of course - I just had to do a video tutorial. Hope you enjoy it.